As I flew back to Kenya in late February, having spent some weeks in Fort Collins, Colorado, I was eager to get back to the field after an insightful learning experience at the Fellows Workshop at the Center for Collaborative Conservation. At the time, I had no idea that I was about to experience the most demanding conflict season in my ten-year tenure at Lion Guardians. And it all started before I even set foot in our field camp. East Africa was receiving some of the heaviest rainfall on record, and the effect it was having on the roads was hazardous, to say the least. That homeward bound trip, which usually takes five hours drive from the capital Nairobi, turned into an unimaginable adventure spanning three days. It took a total of three small aircraft flights, 13 vehicles, four organizations, and the assistance of 37 people, just to navigate the flooding. Over the next few months, Kenya continued to experienced ‘El Niño’-like flooding, and the grass grew taller than ever seen in local memory. 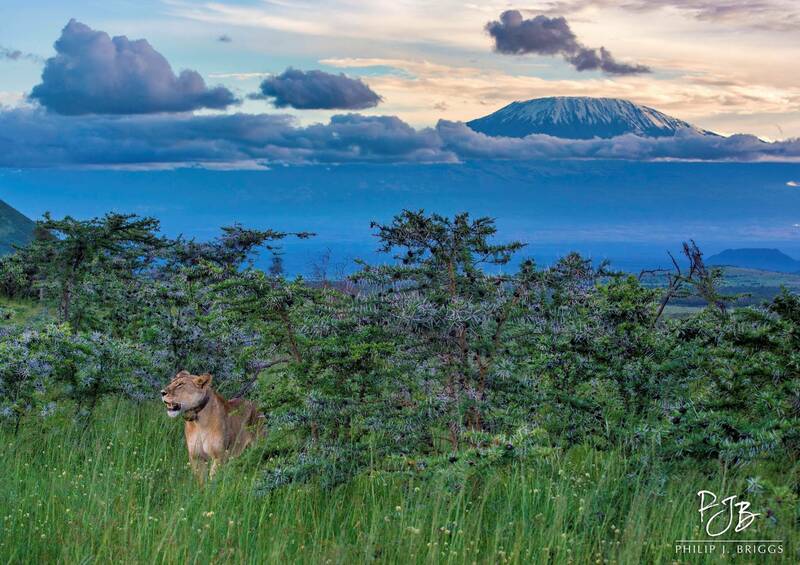 Lioness ‘Nelowua’ stands in a sea of grass with Mt. Kilimanjaro at rear. And with the rain came a dramatic spike in lion-livestock conflict; lions were struggling to kill wild prey (herbivores often move extensively locating new green pastures and gain strength to outrun predators) across the entire ecosystem. In a fight to keep hunger at bay, lions risked persecution daily by targeting livestock, primarily at Maasai homesteads (bomas) during the night. The conflict was as bad as we’ve ever recorded, and our team spent day and night, often camping in the affected areas, trying to prevent lions from raiding. Together with teams on the ground, including Big Life, Born Free, and KWS, we mitigated the conflict as much as possible during more than five months of unpredictable, demanding, tiresome, and seemingly unrelenting pressure. In his blog post in March ( //collaborativeconservation.org/2018/04/26/the-green-hills/ ), Kevin discussed the Maasai’s tolerance of lion depredation, and I found this season to be of particular interest on that topic. The communities were particularly tolerant of the raiding, as long as we – the conservation organizations – were proactively trying to find solutions to the conflict and halt the onslaught. But we were often given ultimatums; for example, the communities told us that if the lions were still causing issues in 10 days, then they would “take matters into their own hands”. So we would fight the clock trying to alter the lions’ behavior in the hope that they would stop targeting bomas. And it worked…the combination of preventative efforts we used was enough that the communities could see a difference, easing their intentions to go and kill the culprits. “Caught Red-Handed” – Sub adult male ‘Koyiombo’ is identified as the individual who was repeatedly raiding bomas in one community of Eselenkei. 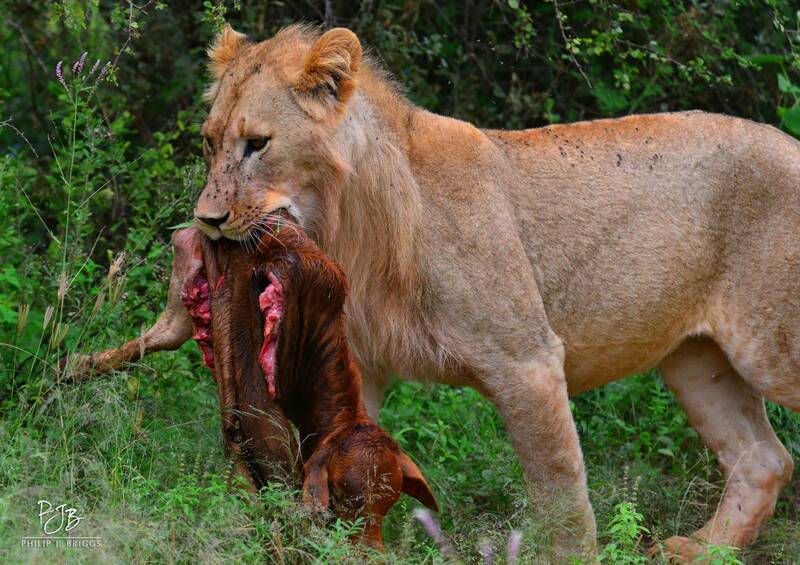 In this photo, he is moving a calf he had killed overnight. Once we knew his identity, the Lion Guardian team performed a ‘mock hunt’ directly after another boma attack, scaring him enough to stop his livestock killing habits, at least temporarily. Cattle-raiding at bomas is often a short-lived seasonal behavior of lions, and the topic our research project is trying to address is lost livestock being killed by lions out in the bush. What’s interesting about the recent rainy season is that the number of lost livestock has drastically decreased (this year, the lost livestock figures are about 50% lower than average). One of the prominent reasons is that livestock herds do not need to roam as far and wide as they normally do during dry/drought seasons searching for pasture. 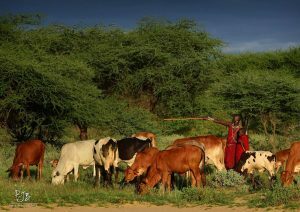 They are barely going 5km per day from their bomas, compared to the 10-12km (20-24km round trip) of dry season grazing. Since the chances of encountering a predator increase the longer livestock are lost, you can easily imagine, for a lost cow, how much more treacherous being lost 12km from home would be, compared to just 5km. And a similar issue applies to the livestock owner; finding the lost livestock is much easier within 5km, opposed to more than double the area. Guardians are spending increasing time with young herders to keep them vigilant, regroup their livestock, and show them where to avoid lion hotspots. If a researcher came to measure husbandry practices and livestock movement in the Amboseli region over the past six months, I’d predict their data would be unfairly biased due to the unusually plentiful grass, and they’d likely conclude that lost livestock isn’t an issue. Thankfully, the research we’re conducting on lost livestock will be taken from more than a decade of ecosystem-wide Guardian data ensuring that it documents much larger-scale trends. When unusual weather patterns occuyr, it often exposes certain trends and masks others, and I wonder what we can learn from this season. The Guardian data will surely be insightful once fully analyzed. Will lost livestock only ever be a problem during dry seasons? Are there simple herding mistakes that can be eliminated during dry seasons to reduce the vast numbers of lost animals? Can something as simple as not driving cattle for more than 5km a day make a significant impact? One thing we know for sure is that we won’t experience huge rainfall on a consistent basis, and with every exceptionally wet season, there is a mirror effect to the opposite extreme, meaning heavy drought and the potential for thousands of livestock to be exposed to predators while being lost out overnight. Our research on this continues, and we look forward to some of the new observations we will make, as extreme and increasingly unpredictable weather patterns continue to keep us on our toes in the fight to reduce lion-livestock conflict.